I’m incorporating these 3 things into my daily routine and it’s making ALL the difference. Apparently, they say that if you DON’T supplement with #1 and #3, you WILL encounter all sorts of issues now and later. So it makes sense that my gut just feels better with these things. History class sidenote: The ancient Greek physician Hippocrates (who was all about digestion) said, “Let food be thy medicine, and medicine thy food.” A multitude of ancient cultures throughout history actually used these very 3 things we’re talking about here to stay healthy…as part of the herbs, spices, and raw and fermented vegetables they ate! Pretty cool, huh? Functional medicine and integrative medicine doctors will inform you that you absolutely can do something to improve these things, just by taking care of your gut! You’ll be doing MUCH for the sake of preventing all sorts of long-term, complicated issues as well. Doesn’t get better than that! Here’s what I’ve found to be AMAZING for my digestion. These 3 things are so simple. 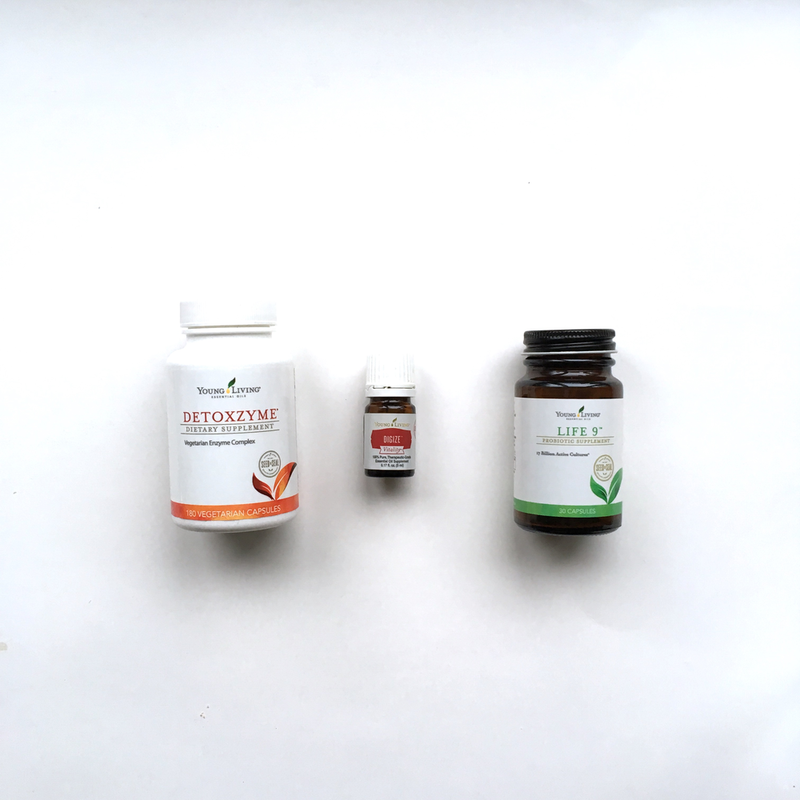 And everyone needs them, no matter your level of health or un-health…these 3 will be your baseline to keeping your body healthy. I will admit, I’ve taken out gluten and most dairy, since those are major inflammatory foods and the root of many evils in our bodies. That being said - adding these 3 daily things, minus gluten and dairy have brought SO much benefit…without having to do anything drastic like Paleo or Whole30. Our ancestors didn’t have refrigerators. They fermented, pickled, and cultured their food with good bacteria that kept the food preserved from decay-inducing bad bacteria. Yogurt, kefir, sauerkraut, pickles, kimchi and kombucha are ancient foods that gave their eaters a steady supply of good bacteria that all of our bodies MUST to have to stay healthy. Their guts were super happy, and it helped them resist the bad bacteria in their environments. Probiotics not only can help your balance of good/bad bacteria, but studies show that taking probiotics can directly impact our emotional state of being and our mental health (see this study!). A lack of probiotics makes us prone to anxiousness and emotional unrest. Our gut is known as The Second Brain, and to keep it sharp we need to have a healthy microbiome. If you’ve EVER taken antibiotics, your immune system, skin health, capacity to resist fungal infections, energy levels, and so much more have taken a huge hit. The only way to restore the balance is to amp up your probiotics like crazy. Take 2-3 servings a day for a week, then resume a maintenance dose of 1 serving a day. I use either Life9 probiotics from Young Living, or Jarrow Probiotics. They’re both trustworthy companies …and quality really matters here. The picture above shows the two options I alternate between. Young Living’s has 9 strains, 17 billion live active cultures. I only take 1 daily. Jarrow’s only has 6 strains, 3.4 billion live active cultures. So I take 3-4 daily to equal YL’s dosage. Life9 Probiotics are free this month if you’re on ER! One note - these probiotics must be LIVE! They have to be refrigerated. Beware of most so-called “shelf-stable” probiotics. Many brands of probiotics are lower quality, and the organisms are dead by the time they reach you. So make sure you have a high-quality source that lists a “use by” date, and make sure you’re keeping them in the fridge. I take mine before bed (when nothing else is going on in my stomach) to maximize their effect. Click here to read all about why DiGize works like magic. Or if it’s winter and I’m trying to keep my immune system healthy - then I take it religiously. If you’re ok with the smell, rub it on your stomach or feet. Or put a drop in your mouth or in a little water. It’s so amazing I can’t even get started here or I’ll write another book. Just read the post about it here. Thankfully, for those of us doing cleanses and kickstarting our metabolism and health - it’s FREE this month with a 100pv order if you’re on Essential Rewards! If you haven’t heard much about enzymes, go ahead and do a little reading! Check out “Food Enzymes 101” from a few days ago. Your pancreas and your GI will be SOOO happy if you help it out this way. They’re the missing link when it comes to getting all we need out of our food without the nasty effects of in-digestion, not to mention weight gain, skin issues and all sorts of long-term irritation. I take them with big meals to help me break them down quickly so I’m not sluggish or dealing with indigestion. Here’s the one I love. I used to experiment with various brands, and there are a few quality (and pricy!) brands out there that are really good. But I’ve found these 3 options the best for their cost per pill, and the quality of the contents. That quality matters, too!! Heat-processed enzymes are inactive enzymes. You want active enzymes, no corners cut in the processing. You want multiple types of enzymes present, in good ratios, that are well-utilized by the body. And with all that I’ve experienced, I absolutely trust Young Living’s process and their research & development team! 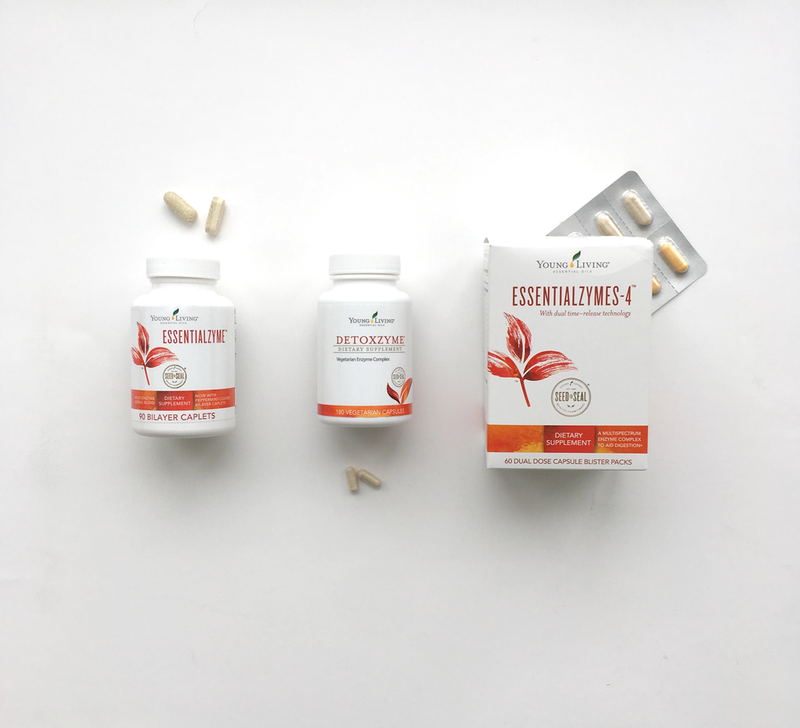 Young Living wisely pairs their enzyme supplements with essential oils like Anise, Ginger, and Fennel that have been used after meals for thousands of years to maximize the body’s digestive process. To know which of these is best for you, read up on enzymes first to see what they do. People ask me which I use, and it’s usually DetoxZyme or whatever most recently came free with Essential Rewards! :) But really, you can’t go wrong with any of these enzyme options. If you have burning after meals, try Essentialzyme (because of its Betaine HCL content) and take one tablet 30 minutes before the largest meal(s). If you want to cover all your bases for both the now-and-later of digestion, pick Essentialzymes-4. It’s pretty comprehensive! Your body is the only one you’ve got - and these 3 things: probiotics, enzymes, and digestive herbs/oils are highly encouraged by all functional and integrative medicine experts for supporting your all-important digestive system (and the rest of you!) for years to come. Here’s to a happy and healthy gut in 2019!